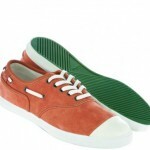 Lacoste is showing off their Aw 2011 Sneaker Collection that focuses on the classic RenÃ© Lacoste 1963. The idea is to bring back five silhouettes and give them a contemporary twist that reflects the present without losing any of its old charm. The models include the RenÃ© Nautical, Asymmetric, Brogue and Overlay, all of which have been updated with minor details that are more than welcoming.